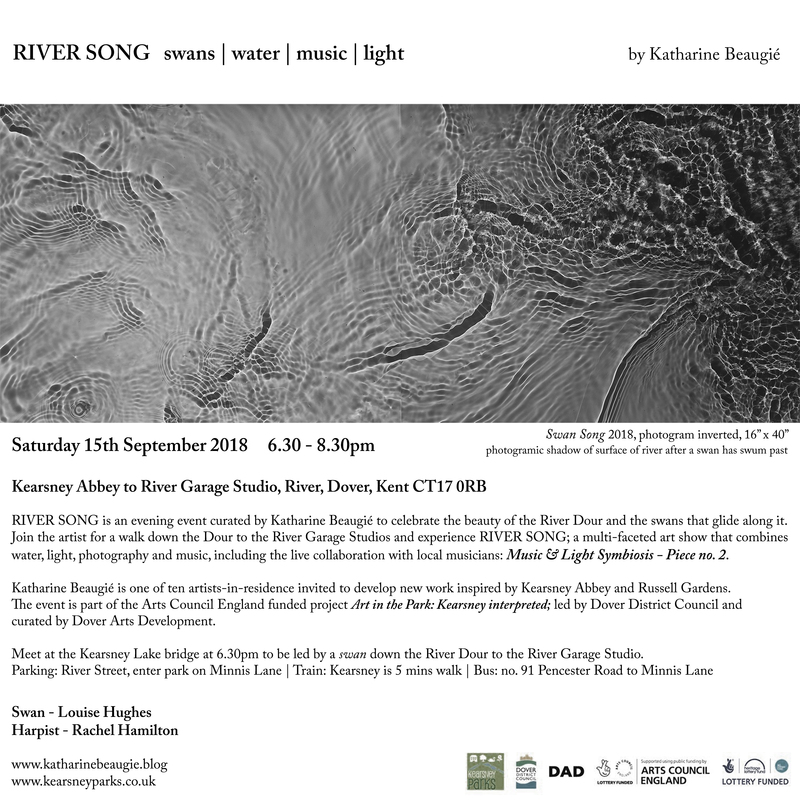 I have been invited by Dover Arts Development (DAD) to be an artist-in-residence in the project Art in the Park | Kearsney Interpreted, commissioned by Dover District Council and the Kearsney Parks. This is an exciting prospect as I used to visit Kearsney Abbey as a toddler with my Grandmother, Elise Radcliffe. She introduced me to the magnificent swans that glide around the lakes and the pure and sparkling water of the River Dour; a chalk stream that runs through the parks and forms lakes and weirs. Earlier in the year, a dog killed a male swan and the cygnets, leaving a female swan without her partner and brood. I found this to be so moving, as swans mate for life. I felt it would be positive to make an event to acknowledge this loss and gather as a community in the Kearsney Abbey to commemorate the loss of the swans, but also, loss in general. My feelings of loss are strong in the park as it is where I spent a lot of time as a very small person, and the it feels like a loss of a by-gone era, when innocence and purity felt normal to me. The loss of my Grandmother and the loss of my mother’s childhood, who also spent time playing with her friend, who has also sadly died. But alas, the idea has been rejected on the grounds that the Dover District Council cannot be seen to be “capitalising on the death of the swans”. So idea no. 2 River Song is created; the idea of the pristine water and the swans actually making music in the form of a song. This project will involve recording the natural phenomena of the sparklingly clear water and the movement of the swans through the medium of photograms and through the use of music, namely the classical music piece, The Swan (Le Cygne) from The Carnival of the Animals by Camille Saint-Saëns.